Un coin de paradis à quelques pas de Coco Beach! Venez tomber amoureux de PARADISE! L'une des meilleures parties de ce condo privé est la proximité de l'incroyable Coco Beach! Vous êtes à 60 secondes à pied de la plage et juste un pâté de maisons de plusieurs restaurants et un mini-marché. Pas besoin de louer une voiture si vous restez ici, ce qui vous fera économiser des centaines de dollars! Cette unité de 2 chambres à coucher entièrement meublé est livré avec une belle cuisine et beaucoup de salle confortable pour dîner avec des amis et la famille. La table, le garde-manger et les armoires en bois dur personnalisés offrent un cadre de style costaricien et un espace confortable pour prendre les repas ou tout simplement se détendre après une journée à la plage. La piscine comprend des meubles de jardin, un petit bar avec comptoir pour préparer un goûter et une douche extérieure. La profondeur de l'eau est idéale pour faire des longueurs ou se prélasser sur des flotteurs si vous préférez nager juste devant votre porte. Deux salles de bain complètes, toutes deux avec douches. Great access to everything we did. Clean, spacious. Needs railing on steps for those of us who are viejo. Electric oven did not work. All minor except for railing. Pool and ocean easy access. 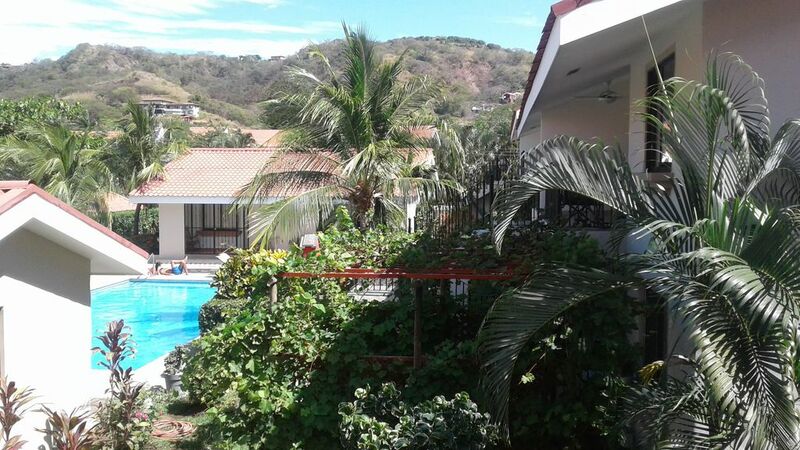 This is the perfect location to enjoy the Pacific coast and the vibrant town of Coco! It’s just a short walk away from the beach, about 1/2 mile walk from town or a $2 cab ride. The condo had everything we needed to enjoy our vacation. We especially appreciated the cooler, beach bag and chairs for us to use as well as the pool, just steps from our doorway. The owners were wonderful as was Krista, the property manager who met us at the door when we arrived, answered all our questions, provided us with coffee, water and snacks to start our stay and was a text away to answer questions during the week. The Wi-Fi and air conditioning worked great and were an added bonus. We spent four wonderful weeks in Josie and Rick’s condo, it was our first visit to Costa Rica. We had done some preliminary research on Playas del Coco and its surrounding region and decided that we did not need to rent a car. We found that it took us 5 to 7 minutes to walk to a shady spot under trees at the beach and 20 to 30 minutes to get to any point in town. We only needed to take a taxi (very reasonably priced) when we were loaded down with food from one of the three supermarkets we had selected that day. Neighbours in the next condo had already spent over a month in Coco and told us about days when specials were offered at the various downtown supermarkets. There is a little supermarket just down the street that we visited when we ran short of something. We found that the fruit stand on the way to the beach had a good selection at reasonable prices. A fisherman visited the complex at various times with fresh fish and shrimps and we also visited a good fresh seafood market in town. We were warned that prices would be higher than in Canada and they were. Although there are many restaurants in and around Coco, there are three or four down the street, we preferred to cook a majority of our meals and found the kitchen in the condo very well equipped. Josie had organized to have on our arrival a number of welcoming local snacks, coffee, pineapple, etc. which were very much appreciated. They provided for us an intro into local foods. Our favourite spot for eating our meals was on the balcony off the main bedroom which looks over the pool and distant hills, a great view and pleasant spot when there was a bit of a breeze. Having decided not to rent a car we used the same taxi to visit interesting places around Coco and had one of the local tour companies take us to the Arenal volcano region. We found we gained much by having local tour guides rather than touring on our own. Josie and Rick’s condo in Las Playas del Coco is a great place to spend some time away from Canadian winters. We enjoyed the very hot weather and visited the pool and the sea a number of times a day. Thank you so much!!! I am so happy to hear you had a great time and we were part of making your vacation a memorable one for you and your family! Thanks for all your info to help our quest know that we are in a great location!!!! We just spent 2 weeks from February 6th to the 20th. The condo was clean and spacious for the 4 of us., We really enjoyed how quiet it was and even the pool was quiet most of the time. The condo neighbors are super nice and helpful with anything that they can help you with. It’s a small walk to the beach and maybe 15 min walk to town. Chris gave us a tour of the town when we arrived wich was really nice and helpful. He was also always available by text or email if we needed. We noticed alot of the furniture was brand new. Even had blow up stuff for the pool, bug spray and sunscreen in case you didn’t bring any. I highly recommend the condo. It is beautiful, clean and 10 steps away from the pool. We will be returning for sure. We are very happy to know that your stay at our Condo was a great experience for you and your family! We will be looking forward to seeing you in the furtive! Thanks so much it was a great pleasure ! This was a great location. Close to everything, beach, restaurants, grocery would stay there again! My husband and I just returned home from our first visit to Costa Rica, we loved it. Such beautiful country and friendly people. Josie and Rick's condo is great! We loved that we were steps away from a nice pool and then across the street and a short one block walk to the beach! Also this area has a great little "plaza" with several restaurants super close to the condo. We tried three of the six or so and loved all of them. We also were able to do a loop by either walking on beach or street into town and back and enjoy the main street of Las Palmas. Super markets were great as well as restaurants in town. No issue at all using US dollars and credit cards everywhere. Thank you so much for staying with us and we are very happy that your vacation was a memorable one! It was a pleasure on our part. This was our first visit to Costa Rica. We really did not know what to expect. It was absolutely wonderful. The property, for me and my partner was extremely right. It’s in a neat condo complex that includes a very nice pool, free washer and dryer ( we brought too many clothes! ),two quite comfortable bedrooms, a well-stocked kitchen, and is located just a five minute walk from Playa del Coco Beach which from what we could see was the best possible beach in the area - clean and uncrowded. We did rent a car for a couple of days, and would highly recommend this. We drove to Monteverdi to the rain forest which is something that everyone who visits Costa Rica really needs to do. There are plenty of day tours for about $125 a person . And people on the beach with boats who are happy to take you out to fish or snorkel. US dollars are very welcome although if I did it again I would use more Costa Rican currency as I believe the exchange rate would be better. We will certainly go back to Costa Rica and stay in exactly the same place because it’s just about perfect. Thank you so much Kate !!!! We are so happy to hear that you had a amazing experience staying at our condo and all that the area has to offer ! Thanks for all your added info which will help future quests .We would love to have you back to make more memories .